This was a great dressing to go alongside the Radicchio and Orange Salad. It can also be used for other salads you might like to eat. Roasted beets with avocado, spinach salads, or maybe fennel, green apple and carrot salad. I'm deep into the preparation for the Eat Fat Lose Fat diet (by Sally Fallon and Mary Enig), and just realized that over the holiday I will run out of raw milk. One of the guidelines of the Eat Fat Lose Fat diet is to consume two calcium-rich foods per day with meals. Coconut Milk Tonic to the rescue! If you cannot find, run out of, or don't wish to purchase raw milk, this coconut milk tonic is a good replacement as it has similar calories, calcium, and fats that whole raw milk has. Even with all of the dairy free milks that are available now, I find that this DIY homemade coconut “milk” is quick to make and cheaper than buying it at the store. More importantly it doesn't have a bunch of other ingredients that you don't want. Coconut milk tonic is great on cereal, in oatmeal, and with meals. I find that if I drink this with a meal that I have less cravings between meals, and WAY LESS sugar cravings. There is something about having a serving of a calcium-rich food that does this to me. For a truly homemade coconut milk, made from actual desiccated coconut go here. The quiche recipe in Nourishing Traditions is absolutely delicious, and if you haven't tried it yet, I suggest you give it a try. Quiche is always a crowd pleaser and this recipe is dressed to impress. When I first read the recipe in Nourishing Traditions for the Poppy Seed Cake I wasn't entirely sure what to make of it. Like most Americans I've been raised with cake mixes and their preparation makes the entire cake baking and making process seem so quick and easy. That's even how they're actually sold to the consumer. I'm a huge fan of Middle Eastern food and this recipe was a welcome surprise to the usual fare. It's a truly unique version of one of my favorite foods too—tuna salad. Usually Mediterranean tuna salad is made with canned tuna packed in olive oil. To this is added beans, parsley, lemon juice and oil. Sometimes a few olive are tossed in on top. But this recipe, it's more like an American tuna salad—and we loved it! The entire platter was devoured in no time. Apricot Butter – The Most Delectable Spread! If you've been wondering about different ways to use your delicious homemade cream cheese, here's a great recipe to pair with it. Steak Tartare – Fancy and Easy! I know. Raw beef is not going to be for everyone. Yes, then there is that tiny matter of a raw egg yolk—or two. I simply cannot say this loudly enough: it is worth the plunge! Steak tartare tastes amazing, is filling, and is a whole food recipe that's difficult to argue with because it's simple, pure, and true. Delicious flaky crust is at the heart of many of our favorite dishes. From fruit pies to quiche, without great crust, the dishes simply don't succeed. I think it's for that reason that in Nourishing Traditions this is the one recipe where the principles of the cookbook are compromised and unbleached white flour is used. Every so often I find a gluten-free (and dairy free) dessert recipe that's a traditional dish hailing from some other part of the world where they've simply never added wheat or any other kind of gluten to the recipe. When this happens, I'm grateful and I rejoice. These sweets often taste better than desserts where we're trying to replicate something we can no longer eat. For some reason I thought seafood stock would be hard to make. However, after trying it I realized, it's actually the easiest and quickest of the broths to make homemade! Plus it tastes so good in soup recipes and sauces. Liver is very nutritious and yet it's an often overlooked dinner item. Yes, it does have a strong flavor and taste, but, believe it or not, this is not a new problem. Cooks have been trying to alter and change the taste for generations and this recipe benefits from those efforts. When I was a kid I absolutely LOVED Campbell's brand cream of mushroom soup. Back then, we just ate it as soup, not as an ingredient for other recipes as much. And it had a lot of mushrooms in it! Well I haven't tasted that soup for at least 6 years but now I know that it's actually easy (and way healthier) to make your own. And it doesn't take as long as you think! I've been eating bulgogi (Korean barbecued beef) since before my twin girls came home from Korea 17 years ago. This dish is delicious with kimchi or any of the fermented vegetables, especially ginger carrots, or both! I didn't start making this at home until a year or two ago though, and I didn't realize how easy it actually was to make. Most restaurants use the regular soy sauce to marinate their meat instead of gluten free tamari, so it's hard to find a gluten free bulgogi out of the house. Carpaccio – Raw Beef Italian Style! The first time I had carpaccio (italian style raw beef), I was on a business trip in Israel. Business trips are great for trying new foods, since you're not footing the bill! I was a bit nervous eating raw beef, but Israel's treatment of beef is in general much better than the US. The taste of the raw beef with the sauce and the capers was amazing. And since the dish is raw it is such a cooling appetizer to have on a hot summer night, and the protein is very easily broken down by the body. It even can be a light dinner with a small salad on top and a piece of crusty bread. I think this dish lends itself even better at home, where you can control more easily the quality of the beef. I use grass-fed beef filet for this dish, and it really is a great way to serve beef as an appetizer to guests when you don't want to spend a lot. This is a simple yet rich sauce that takes advantage of all of the abundance of farm fresh eggs this time of year, and an easy alternative to making fussy hollandaise sauce. The sauce is great for so many different recipes… a sandwich spread, vegetable dipping, or even on meat or fish from the grill. Since the yolks are added raw for extra nutrition, ensure that the source of your eggs are super fresh. I get mine from a few different neighbors and farms around my area. The yolks are almost bright orange so they make this sauce a deep yellow! Don't be afraid of the fat in this recipe… it's full of good fats and tons of nutrients, especially if you use homemade mayonnaise partly made with coconut oil. 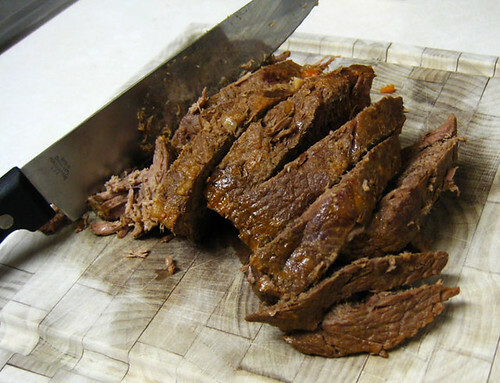 This Pot Roast Will Melt in Your Mouth! I know that it's probably hot where you are right now (if you're in the US), but I couldn't resist this Nourishing Traditions recipe! Before this recipe, I had always made pot roast the ‘regular' way of just cooking the meat without marinating it in buttermilk. Let me tell you, the result with this recipe was a much different, basically melt-in-your-mouth pot roast! I'll never make it another way again. Ranch dressing is my favorite, but I refuse to buy those packets of seasonings that may have questionable ingredients, not to mention those yucky bottled dressings with added sugar! So I developed this easy, inexpensive homemade (no sugar) ranch dressing recipe that literally takes less than 5 minutes to mix up and doesn't even require a blender or food processor. I should call this “Kim's Lazy Ranch Dressing” recipe. Are You Still Buying Bottled Salad Dressing? Try This Instead! I started making this blender dressing over a year ago, and it is the easiest and best salad dressing that I've ever made! This dressing is reminiscent of that Olive Garden (from what I remember) Italian salad dressing, except a bit creamier and less acidic. It's also packed with good fats, and lasts a long time in the fridge (a couple weeks for me). I love that there is no added mayonnaise in this dressing, it makes it own! Eggnog makes a quick and tasty breakfast, and if you have a milk allergy, you can also make it dairy/casein free with coconut milk tonic (or even just coconut milk)! This recipe has really been hitting the spot for me this week and is very satisfying. It's not just for the holidays, but is great any time of year. I love it with nutmeg and cinnamon! In this recipe inspired by Nourishing Traditions, raw fermented sauerkraut is bumped up from condiment to side dish, and it's a well deserved promotion. I love the salty sour sweetness of this salad. Really this is good any time of day, I've eaten it for breakfast with some good bacon, but it makes a great last minute side dish for dinner or lunch. This also may be a good introduction to raw fermented vegetables (due to its slight sweetness) to those who are not used to the pleasing sour taste of sauerkraut. Try it, and let me know what you think in the comments! Carrot is the new pumpkin! Yes I know there's many of the larger orange orbs around right now in most areas, but please don't forget the lowly carrot. Carrots deserve your support as they smaller, tasty and more portable! Okay, yes that was weird, but carrots bring out the weirdness in me, maybe it's all of the vitamins, they give me more energy. I made this simple soup today with about 15 minutes of hands-on time. For a quick lunch or first course, you can't go wrong, and the price is right as you can grow the two main ingredients yourself! It's fall and we are getting a TON of rain. I had to cut the basil plants down today, so I thought I would harvest everything and make pesto! I can't wait to have a yummy Friday night dinner of pesto on brown rice pasta. My Husband Ate This Soup and Liked It! For those of you that have been following the blog for awhile, you're familiar with my husband Shawn. He is a meat & potatoes guy, the more beef and bacon, the better. He has also been averse to ANY soups and stews for pretty much his whole life, even if each separate ingredient is something that he likes (beef stew for example). This leaves out a large chunk of easy (and inexpensive) recipes that he won't eat which has been a huge challenge. He will eat chili out of a can, seafood or clam chowder but that pretty much is the limit. Squash Your Pre-conceived Ideas of Squash! I now have some really pretty yellow and green striped Delicata Squash, thanks to some wonderful organic seeds! What I really like about this heirloom variety is that it's kind of halfway between a summer squash and a winter squash, and you can eat the skin since it is thin enough. If you didn't grow any, don't despair because you can probably pick these up at your nearest farmer's market right now! This is the ‘new' Hamburger Helper in our house! Not that we've eaten much HH lately, but I do admit to buying it quite a bit when the girls were little (ugh). I call this recipe ‘hash' in my house, and the family loves it. The best thing? It's free of many allergens: gluten free, casein free, dairy free, grain free and so is suitable for those following SCD, GAPS, or Paleo/Primal diet. You can serve this as a ‘one dish meal' or serve it alongside some raw vegetables for variety. You can also add a higher percentage of meat for more of a protein punch.